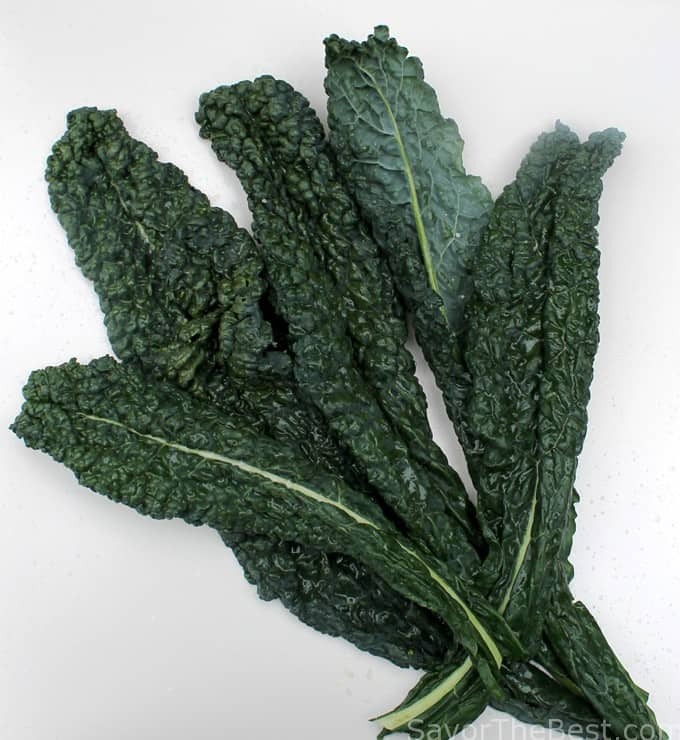 Kale is a vegetable that is full of nutrition, healthy and delicious. It is also a vegetable that I was unfamiliar with until about five years ago. I have been experimenting with it to find new ways to include it in my diet. 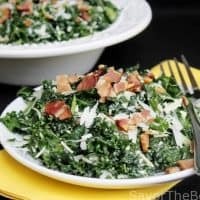 This kale Caesar salad recipe is crunchy and flavorful. 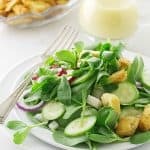 While waiting for my turn in the dentist’s chair, I began browsing through one of the display magazines and saw a picture of a bowl of mixed salad greens which included kale. There was a little blurp about kale having some bitterness and to chop it, sprinkle it with salt and then massage and squeeze it with your hands and let it sit for five minutes. It also said ‘turn to page 91 for the recipe”. I bet you know where this story is going….. I turned to page 91 but, pages 91 thru 93 were missing….somebody had ripped it clean out of the magazine. 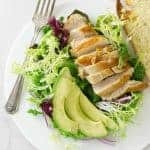 Lucky me, but this is my version of a kale caesar salad which is pretty easy to make with grocery store bottled dressing. I’m using some of my homemade caesar salad dressing and the bacon is a nice replacement for regular bread croutons. Also, since kale is a sturdy-leaf vegetable and it keeps well in the refrigerator I can have leftovers the next day. 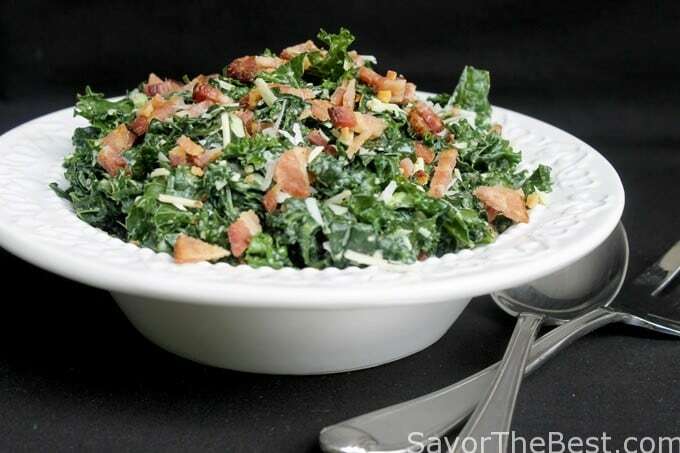 A recipe for kale Caesar salad with crunchy crisp bacon rather than bread croutons. Tear the green part from the kale ribs, discard the ribs and chop the green part into small pieces and add to a large salad bowl. 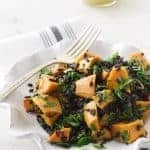 Sprinkle the chopped kale with 1/2 teaspoon of sea salt and using your hands, squeeze and massage for 30 seconds or so. Allow the kale to sit for five minutes. Add the kale to a colander and rinse it under cold running water to remove the salt, then spin it dry in your salad spinner. 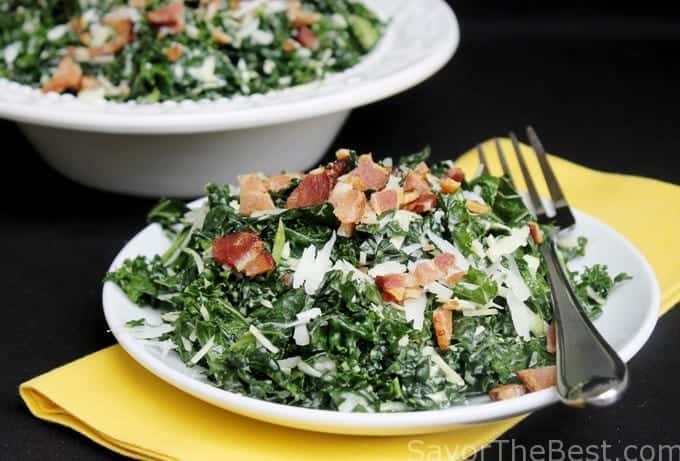 Transfer the kale to a salad bowl and squeeze the lemon juice over it, toss with the salad dressing and parmesan cheese. 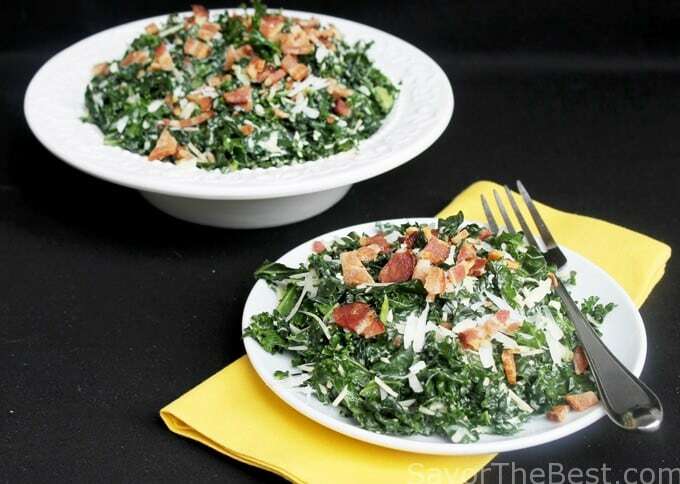 Plate the salad on 4 serving plates and sprinkle with the chopped cooked bacon.